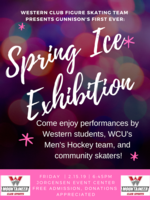 Details: Performances by the figure skating club, men’s hockey, and community skaters all for free! Donations to the figure skating club are greatly appreciated. 5:30pm-7:30pm Senior Community Potluck Gunnison Senior Center, 200 E. Spencer Ave.